This wizard guides you through simple steps to help you to create a new partition on a data storage device. When the Restore Partition wizard starts for the first time, the first screen describes the process. Clear the Show this page next time? check box to avoid seeing this screen the next time you run this wizard. 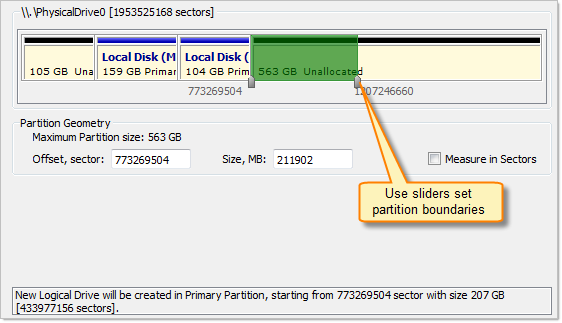 Select the unallocated space where the new partition must be created and click the Next button to continue. This step is optional. Click set so Do not format new partition and click Next button to continue. Review and confirm new partition attributes and click Create Partition button to initiate creation process. A new partition will appear for corresponded disk in Recovery Explorer.